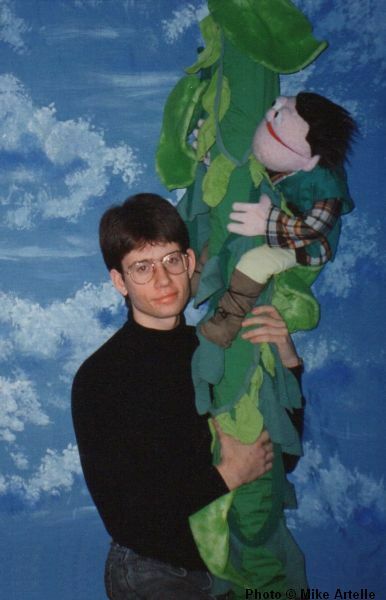 In 1994 at age 20 or 21, a few years after I had finished High School, I created a touring show based on "Jack and the Beanstalk". Here I am with my puppet character Jeremy, posing for a PR photo. 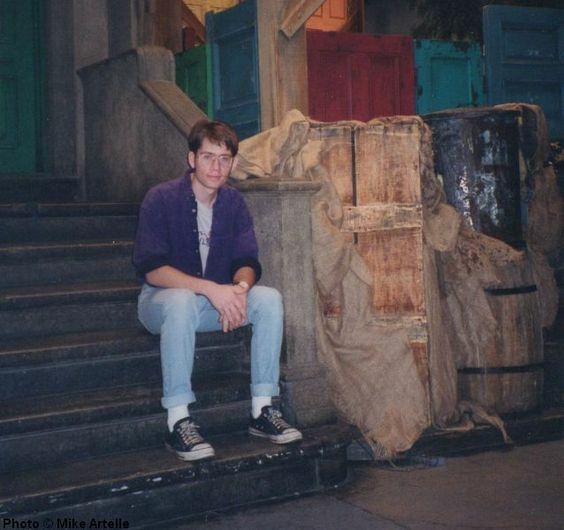 This picture was taken in 1995 during my visit to the Sesame Street studio in New York. I'm sitting on the steps at 123 Sesame Street! 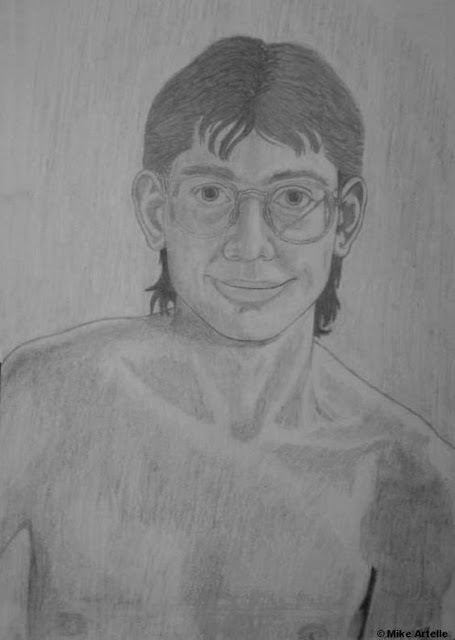 when I was 21 years old. It's a bit wonky in some places but I still like it. 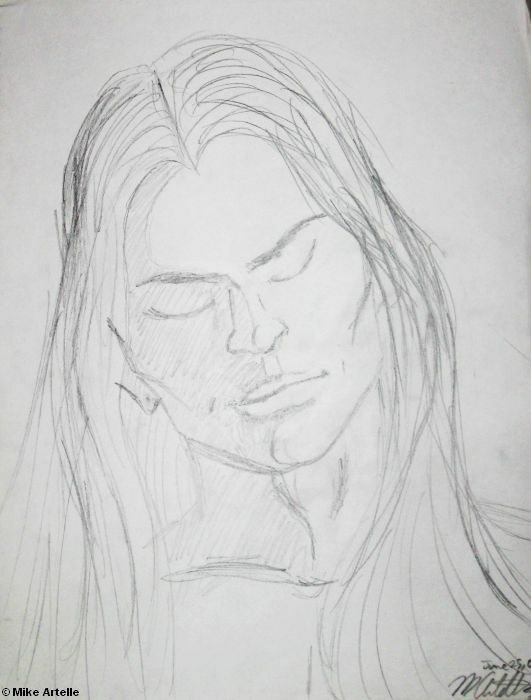 Beginning around 1995 during my early 20's when I was in college, I had begun to set aside my denial and accept that I was gay which I had been struggling with since my teens. Somehow I got up enough nerve to tell my parents and siblings that I was gay, and later told a few of my friends. 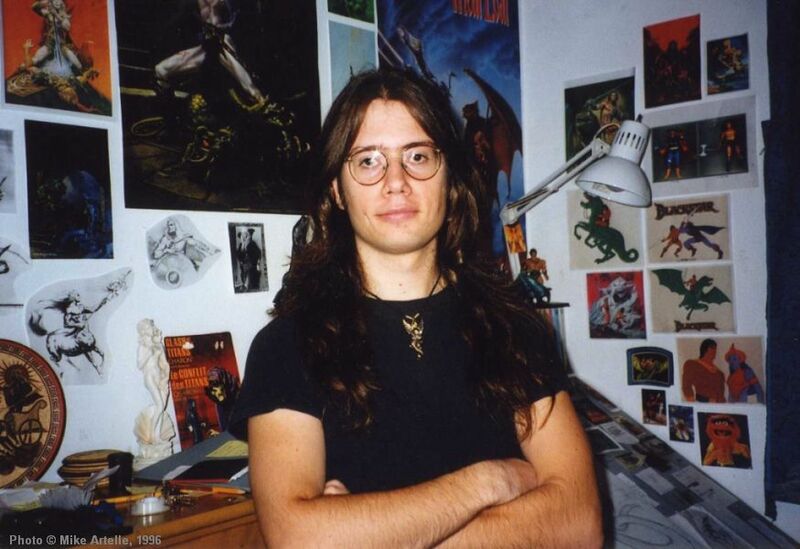 Here I am in my room at age 23 in 1997 around the time that I had studied animation in college. Fortunately, the reply from my family was a positive one, and mostly positive from my friends, yet I kept the fact that I was gay private. To my dismay, coming out didn't change how I felt about being gay, as I still wasn't comfortable with it at all. I didn't understand at the time that I had a major case of internalized homophobia. At this point, figuring out how to be openly gay in a heterosexual world became the next struggle, which in all honesty continues to this day. 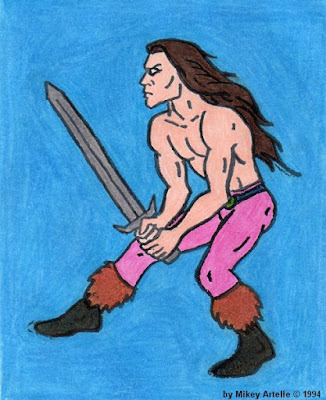 Back then in my mid 20's it didn't take long for me to discover that the combination of being gay, having long hair, and liking hard rock or heavy metal was quite an anomaly! As such, I didn't feel any connection with the so called "gay community" which, from my experience at the time, seemed rather manufactured and tended to dictate how gay men were supposed to think, act and look. In addition, there were many in the gay community who criticized other gay guys who stayed in the closet, which I thought was extremely cruel and hypocritical. This made me feel as though I didn't belong in the heterosexual community or the gay community, but rather somewhere in between which was quite a lonely place to be. Another drawing of a Warrior Dude from my 20's. With some persistence I made a few gay friends whom I clicked with. Therefore when it came to socializing I could alternate between my gay buddies and my straight buddies, and that was fine with me. One of my new gay friends at the time was Duane (seen below), whom I'm still very good friends with today. We met at a gay men's support group. I had to work up my nerve to attend, which took several weeks. Previously I had attended a few of the "20 something" group meetings but unfortunately didn't click with anyone there, so the men's group was the next option. My buddy Duane circa 1999, around the time we first met. Just by coincidence the first meeting of the gay men's group that I attended was also Duane's first meeting, which is likely why we gravitated toward each other. We actually met at the corner across the street from the building where the meeting was being held while waiting for the traffic light to change. Though I'm shy, I suspected Duane was heading to the meeting and asked him as much. We walked across the street and went into the meeting together, and have been friends ever since! Those support group meetings are the first occasions in which I attended events in the gay community, and the first occasions in which I openly outed myself to others, so they were quite a big deal for me. Simply entering the building was difficult, and walking into the room where the meeting was held was quite a frightening thing to do, yet I forced myself to do it. However, I didn't meet all of my gay buddies at those meetings. I met a few gay friends through work or at college, having made the bold (and for me extremely rare) decision to out myself to them. Unfortunately however, there are many cases in which I suspected that a guy at my work or in my class at college was gay but didn't have the courage to come out to him or pursue a friendship with him. Even if a guy had flirted with me and gave me some kind of signal that he was interested, I would be too afraid to follow his lead. This was my internalized homophobia at work. Back then, you really had to hit me over the head with a mallet to get me to flirt back or admit that I was gay, even though I was dying on the inside to do so already. I've always regretted those missed opportunities considerably. Having a larger group of gay friends to hang out with would have made life much more easier. Despite having several straight friends, I was quite a lonely guy. "Biker Mikey" version 2: The Hippie! Here I am in 1997 next to my friend Jay's motorcycle (a Suzuki) shortly before I bought my own, shown below. 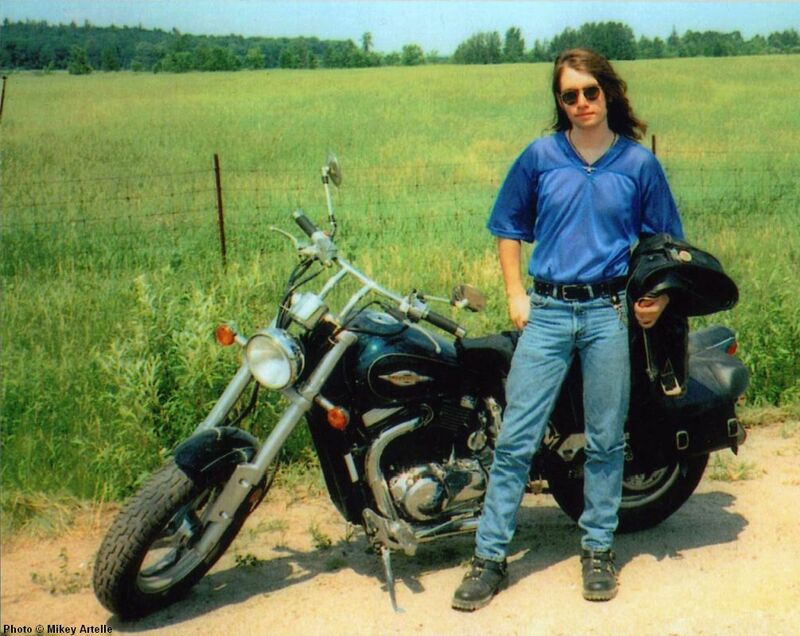 For several years in the late 1990's until 2001 I owned a Yamaha motorcycle which I loved. Some of my friends from college had previously bought motorcycles and helped me learn how to drive one. Riding my motorcycle became a new hobby for me. Instead of going cycling on my bicycle in my spandex shorts as I had been doing since I had finished high school, I got myself a motorcycle and some leather duds! I already had the jacket, so I bought some cool biker boots and a pair of leather pants. I tapered the pant legs myself to make them fit more snug, using the sewing machine that I made my puppets with. 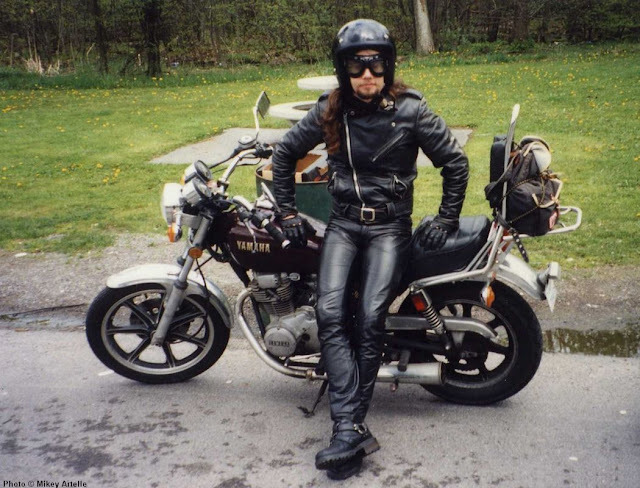 Each summer my buddies and I went on several biker trips that I remember with great fondness. "Biker Mikey" version 3: The Motorcyclist! In the mid to late 1990s as gay rights became more main stream it became trendy for TV shows to include gay characters, or the shows themselves were based on a central gay theme. It was around this point that the expression "that's so gay" became a popular catchphrase used to diminish or dismiss something as being uncool or poorly done. For example, a bad movie would be described as "that movie was so gay". Likewise, a fashion statement, for example, that was deemed uncool could be put down as "that jacket is so gay". The catchphrase was one of the ways in which anti-gay folks pushed back against the gay rights movement. Unfortunately many folks who weren't necessarily anti-gay and didn't quite understand the meaning or source of the expression, yet wanted to be seen as being cool themselves, began using the catchphrase to be part of the trend. As such "that's so gay" became a common thing to hear in general society at the time. Thankfully today the expression has fallen out of use as I had found it quite upsetting and hurtful that people felt so at liberty to use my sexual nature as the very thing that defined something that wasn't cool. To me they were also saying that I wasn't cool, and that I could never be cool no matter what because I'm gay. In fact what isn't cool, and never will be, is to put down someone just because they are different from you. Fortunately, society has matured a lot since my 20's in regards to respecting homosexuals. The gay themed main stream TV shows and annual media coverage of pride events from the 1990's and early 2000's were quite stereotypical, but I think today in 2017 people are generally aware of that. And although there are still movies like Deadpool being made which present homosexuality as something to be laughed at, included in the film only for the sake of comedy relief, I find that the majority of intelligent people in our society no longer accept that it's funny to present gay people that way.